South Bend Golf Outing - Fun for All! A nice golf course...a break in the heat...a few sprinkles but no hard rain...a near perfect day for golf. 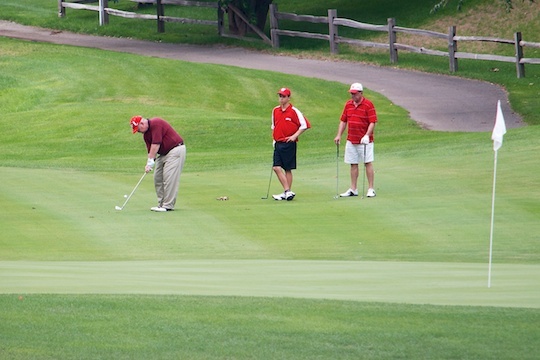 Wabash and DePauw alumni in the St. Joe Valley area gathered for the 12th Annual Outing on July 26th. This year's outing was held at Knollwood Country Club - the course was in superb shape, especially given the drought conditions of the last several weeks. When the smoke cleared, three teams were at the top - separated by a stroke. At 7 under, the winner's were Parent David Hodges, Houston Hodges '15, Andy Walsh '14, and Steve Hoffman '85. Just two strokes back was the DePauw team of Jim Kuehl, Phil Eskew, Ryan Fenstermaker, and Phil Shuman. Many thanks to chief organizer Roger Senkbeil '68 - he's made every outing a big success. Also playing key roles were Roland Morin '91, Roger's lovely wife Carol, and Roberta Alfrey, the lovely wife of Harry Alfrey '64.